JULIE FREYERMUTH: Julie is a co-owner of Polly Parker Press, LLC, author of the multi-award-winning 'Norbert' book series and the proud Momma of Norbert. As a registered therapy animal team for the past five years, Julie and Norbert have spent many hours volunteering to bring smiles and comfort to people of all ages. Julie, along with Norbert and Virginia, give Author Presentations at schools, libraries and other organizations which they consider to be a tremendous honor and privilege. Julie and Norbert live in Carver, MA where they enjoy finding wonder in everyday life, exploring nature, being creative and making others smile. VIRGINIA K. FREYERMUTH, Ph.D.: Virginia has a lifelong passion for art, writing and teaching. She earned Bachelor of Fine Arts and Master of Fine Arts Degrees in Painting and a Ph.D. in Interdisciplinary Studies with a Concentration in Art Education. Virginia was named the 1994 Massachusetts Teacher of the Year, the 1995 Walt Disney American Teacher Awards National Outstanding Art Teacher, and the 2014 Rhode Island Higher Education Art Educator of the Year. Publishing is the perfect combination of her passions, and she is humbled by the possibility of touching the hearts and minds of others through the creation of beautiful books that make a positive difference in the world. She is delighted to be the co-owner of Polly Parker Press with her daughter, Julie. Virginia treasures her family time with Julie & Norbert, her son, Jeff, and husband Richard. Publishing & educating is what we do best. We are a mother-daughter-owned, kind-hearted independent publisher dedicated to creating inspiring, beautiful books to be treasured and loved by children, young adults, and the young at heart. We consider our books to be works of art, finding inspiration in time-honored traditions while re-imagining publishing in the technological age for young people. We view the publication of a book as an important point of departure for further meaningful work that has the capacity to transform lives. We endeavor to become the best version of ourselves by continuing to learn, grow, innovate and inspire others through our publications, philanthropy and role as educators. Personal: To continue to travel and explore, from other countries to own our backyards. To further develop our creative capacities. Business: To publish more beautiful & inspiring books and to create meaningful connections with our readers. To find new ways to innovate and collaborate with others. 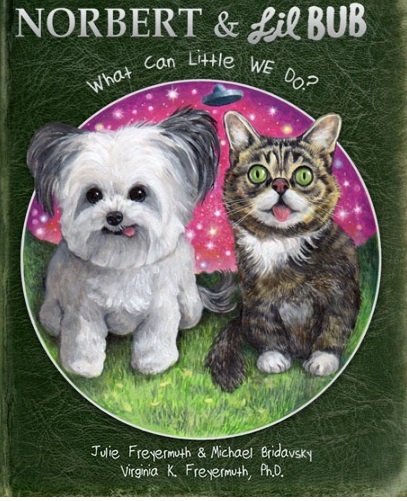 Julie: the positive power of the human-animal connection, the seemingly random yet calculated connectedness of our life experiences, and animated motion pictures! The state of Maine is a favorite annual family vacation spot where we enjoy time for rejuvenation and reconnecting nature with our inner spirits. But in general, we are happy wherever we are. We are passionate about living conscious lives full of wonder, creativity and imagination, accompanied by a pure intent to inspire others and effect positive change. Other passions include: making people smile, reading, traveling, meditating and story-telling.